These statistics are produced using Euraster data set. For the figures below, only the data from countries inside European geographical area are represented (other data sometimes added for transcontinental events were removed). The annual average of different observers over 10 years is ~190. The peak of activity in 2003 is due to a year with several exceptional events (Alphonsina, Bertholda) attracting a lot of observers. The annual average of observations over 10 years is ~480. TAROT automatic telescope observations are plotted with a different color. The annual average of negative reports over 10 years is ~400. The annual average of positive reports over 10 years is ~75 (or ~100 using the 6 last years). TAROT automatic telescope negative observations are plotted with a different color. A "measured asteroid" in this graph is an asteroidal event leading to at least one positive report. 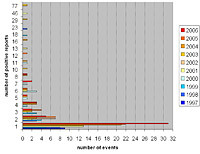 This graph shows the annual number of successful events versus the number of positive reports (O+). Ex: in 2006 (in red), we had 31 events with 1 O+, 5 events with 2 O+, 2 events with 3 O+, 3 events with 4 O+, 1 event with 5 O+, 2 events with 7 O+ and 1 event with 8 O+. These maps show the distribution of the observations over 5 years (2002-2006). Only the positions are plotted here and not the observation frequency for each location. Over 10 years (1997-2006), 30 countries were involved in the European observations. This map shows the distribution of the observations over 5 years (2002-2006) and the frequency of the observations for each location. This map shows the number of positive reports cumulated during 10 years in each country. This map shows the average annual number of observers in each country (average over 10 years). This map is the ratio of the 2 previous ones (but only countries with at least 10 positive reports in 10 years are represented). This graph shows the number of different telescopes used each year by aperture category. This one shows the number of observations per year by aperture category. Number of observations each year for the following methods: visual, video and CCD (mainly CCD trail and drift scan). Reports in the first years didn't mention explicitly the method (but were in fact almost all visual observations). Same graph than the previous one but in percentage. Number of observations each year now for only 2 categories: visual (VIS + unknown regarded as visual observations) and all CCD (VID + CCD). We see clearly that over 10 years, visual observations decreased from more than 90% to 40%, and in the same time CCD observations increased from less than 10% to 60%.